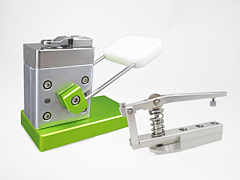 ENGLISH | Ultra-precision jigs,precise blade,composite press-joining,NOGAMIGIKEN Co.,Ltd. “BARINASU”, a hand-operated punch for DBS testing, is used to punch DBS samples for the newborn screening and the genetic screening. The precision of DBS analysis shall be improved because it punches the samples without burrs or contamination. Two types of tools are available to meet the volume of punching shots and workability. It is usable to punch a thin film and metallic foil without burrs or contamination. 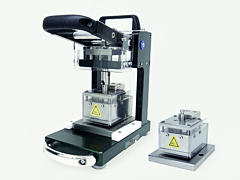 Hand press itself is portable and is suitable for using in glove box. Stamping die covers the larger sizes which are not supported by Handheld Punch. 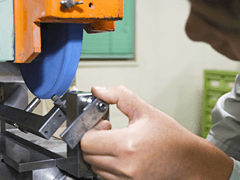 Desk-top precision tube cutting tool improves the product quality, workability and safety. Due to this holder, no distortion, no deformation, no burrs or no contamination is created. We have worked on research in ultra precision grinding technologies for more than 40 years, and their core technology, know-how, achieves a precision of 5⁄10,000 millimeter in parallelism and perpendicularity. We are looking for sales representative, manufacturer’s representative and distributor. Copyright (c) 2007 Nogami-gk. All Rights Reserved.